This 12 Step Guide is designed to help overcome the fear of the UNKNOWN, maximize “soul searching” and to Ignite!! a new chapter in the life of an intrepid traveler. You already have the essential tools at your disposal: Thoughts, Feelings and the ability to take Actions. Now it’s time to become familiar with how to revolve in the journey of life and reinvent yourself, your relationships and your world. 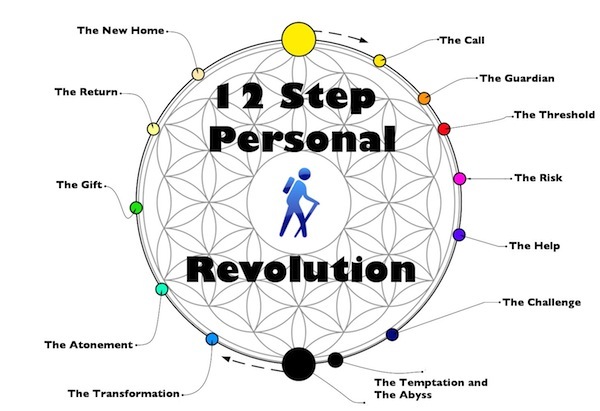 What’s Inside A 12 Step Personal Revolution? Howdy, At some point you may become unsatisfied with what you have, but why fear the unknown of a journey, within the adventure called life? When what you fear is wielding the life-long skill of learning from LIFE itself. Every Journey is broken up into 3 parts: The Beginning, The Middle and The End. The Beginning is about preparation, trust and taking that leap of faith in yourself, knowing who you are and what you're doing and the direction you're headed towards. The Middle is about self reliance and when you get to test everything you think you know and understand about yourself and the world around you. Why you begun your journey in the first place. The End is about How to integrate quality of life upgrades in a lasting way, embrace your newly developed sense of self and share the gift that is your uniqueness with the world. 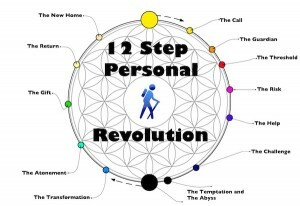 Join the 12 Step Program to Revolutionize Your World!